Donny Osmond has been cleared to throw it again. His voice, we mean. 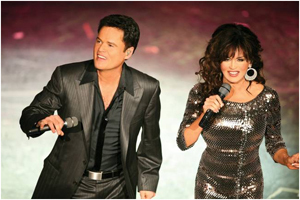 Osmond missed a week of Donny & Marie performances at Flamingo Las Vegas beginning last Monday, sidelined by what has been described by Flamingo officials as vocal fatigue. His first night back is Tuesday (or, tomorrow night, if you are reading this Monday). Marie Osmond performed solo the first night of Donny's absence a week ago, then invited Las Vegas singer/songwriter/musician Jamie Hosmer to the stage last Tuesday. She has since performed with Shane Baker, who has performed with her on her solo tour, “A Little Bit Country and a Whole Lot More." Donny's absence marked the first time in the brother-sister act's three-year run at the Flamingo that Marie performed solo, or with a co-star who was not Donny.